Thank you for helping us make our first Early Childhood Conference with Helle Heckmann such a great success! 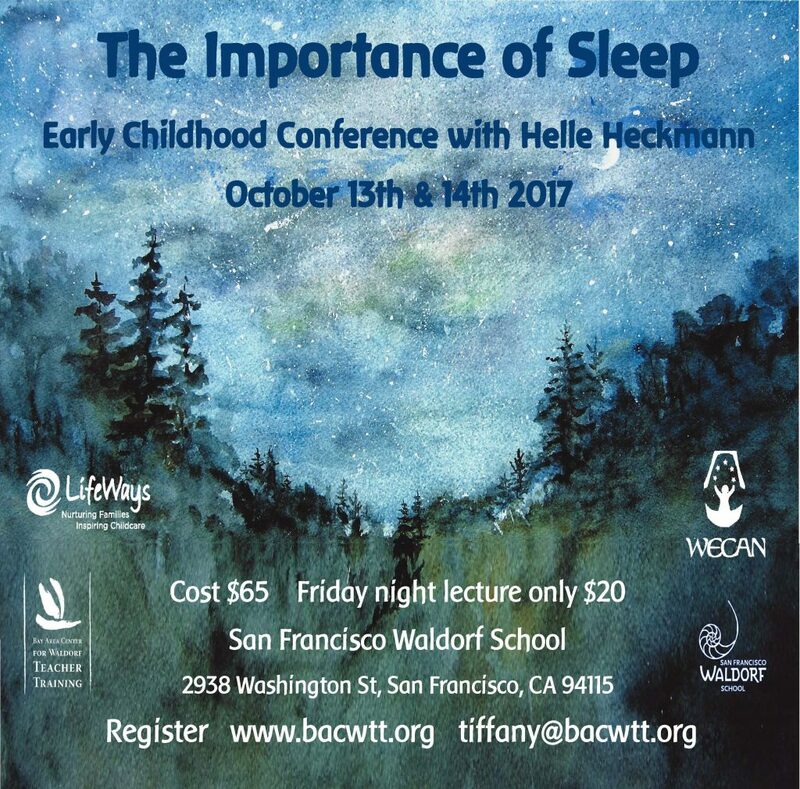 We were pleased and grateful to have had nearly 150 attendees–comprised of a diverse group of parents, teachers, and caregivers–at The Importance of Sleep conference on October 13 & 14, 2017. The lectures and workshops were well attended, and we have included some useful supplemental materials from the conference below. More articles and photos to come! Cynthia Aldinger, The Lion Sleeps Tonight: How can we sleep when Twitter is still tweeting, Facebook is still facing, and emailing is still mailing? Let’s take a glimpse into the world of spiritual social networking that takes place while we are sleeping. Cynthia is the National Director of LifeWays North America. Tiffany Baer, MD, Healthy Sleep, Healthy Body: A doctor’s guidance and group discussion on the physical aspects of sleep. Tiffany is an Anthroposophical doctor and Kaiser internist. Caitlin Connolly, Sleeping Baby, Happy Parents: Caitlin will guide participants in creating a healthy daily rhythm for the family to ensure maximum sleep for the baby. She is a certified postpartum doula. Simone Demarzi, Sleeping at Home and Sleeping at Day Care: How do our sleep habits affect the children in our care? We will share and discuss the different sleep needs, transitions, patterns, rhythms and routines at home and in care and come up with ideas to support our youngest children. Simone is a specialist in home infant care. Isabelle Bridges Boesch, Kerry Ingram, and Amy Jo Mulvaney: I’m So Tired: An exploration and discussion of sleep deprivation, meltdowns and challenging behavior both in children and adults. Isabelle hosts a Mom and Me Mothering Arts circle in her Oakland home and is LifeWays trained. Kerry is a Waldorf Early Childhood teacher and founder of Mothering Arts. She is LifeWays trained and hosts a Mothering Arts circle in Sebastopol. Amy Jo is LifeWays and RIE trained, works with Isabelle and is opening her own home program. Elliot Marshall Cohen and Diana Mei, To Sleep, Perhaps to Dream? : A presentation of current scientific sleep research in relation to the Anthroposophical view of what happens while we sleep. Elliot is a UC Santa Cruz research associate and in house sleep researcher for Pzizz. Diana Mei is Director of the San Francisco Waldorf School’s Parent-Child Program. Anna Rainville, Rock-a-Bye-Baby: An active workshop exploring joyful songs and circle dances, providing wellbeing for all who work with children. Anna is a Waldorf adult educator and an expert in historical circle games. Ingun Schneider, Sleep and Learning: A discussion of the effects of sleep quality on children’s school lives. How can we aid healthy sensory and movement development during the day as an important part of this process? Ingun gives workshops and talks about supporting ease-of-learning for today’s children. Rosario Villasana, Cuidar el Reloj Biológico: Las primeras horas de la mañana y de la noche afectan a los niños de manera diferente. Cada parte del día tiene su característica particular—como se duermen los ninos? Es decisivo que nuestro reloj biológico, este sistema de ritmos entretejidos, reciba el cuidado adecuado. No hay nada más beneficioso para el niño que establecer rutinas saludables para ir a dormir, lo que le hará sentirse seguro y protegido en su vida diaria, porque su reloj interior se lo dice! Con esta regularidad también se crea una interacción sana de los órganos internos para toda la vida futura. Rosario Villasana, M.A., directs the LifeWays en Español training, she is Department Chair/Faculty in the Child Development & Family Studies Department at City College of San Francisco and the happy mother of two Waldorf graduates! Summer Program 2016. 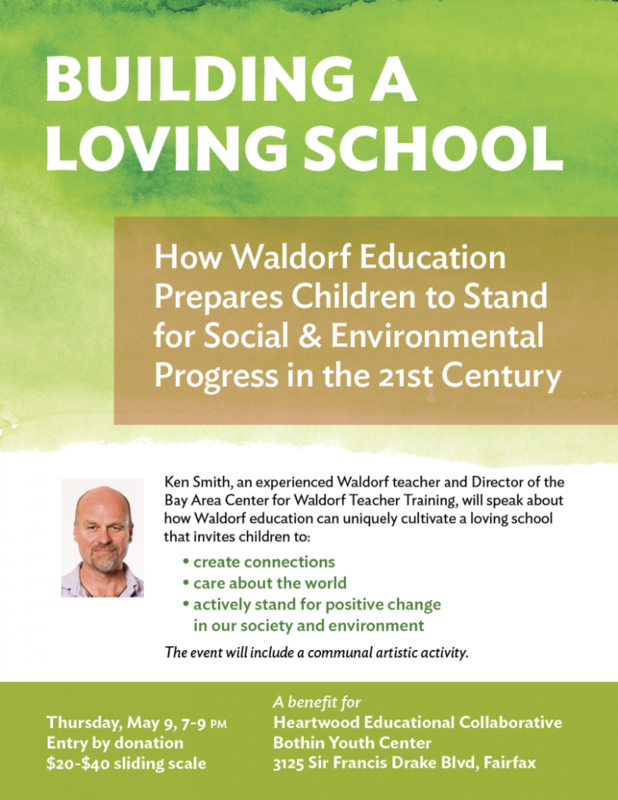 This summer, the Bay Area Center for Waldorf Teacher Training is offering a number of professional development and renewal through the arts programs open to the greater Waldorf Community and the public.